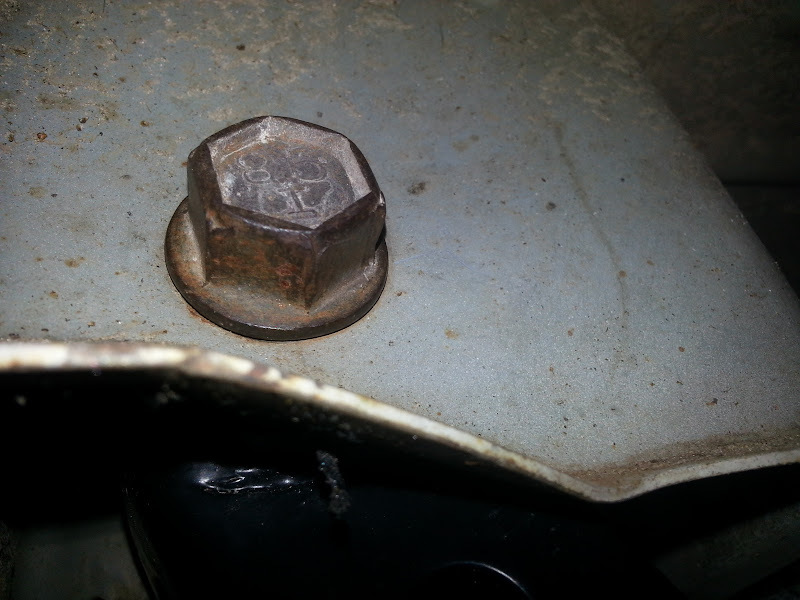 Shackle bolt weld-nut "spinning free"... here's the fix. 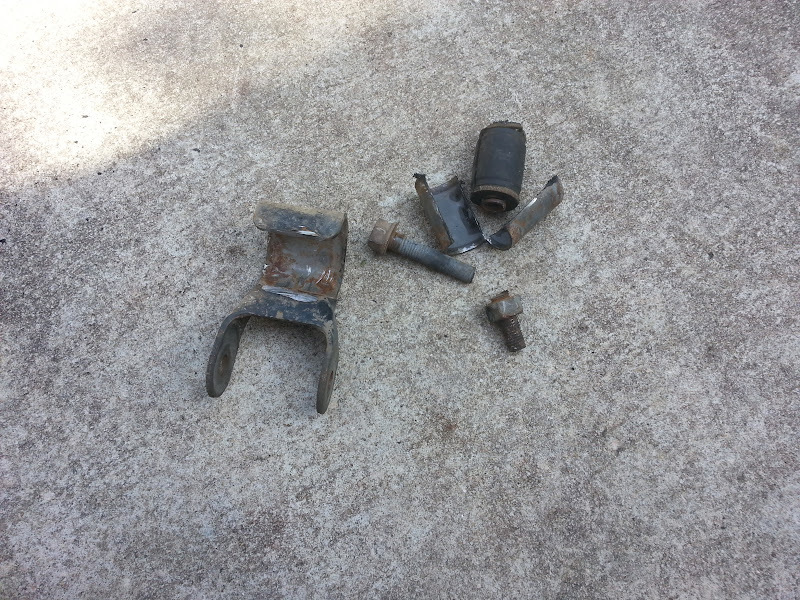 If you're reading this, more than likely you've tried to remove the bolt that secures the leaf-spring shackle bushing to the shackle hanger on the rear of your Jeep, you've encountered... "resistance"... and responded with additional torque (in my case, it was my *ahem* 250-ish lb self standing on a cheater bar) and heard a "snap" that wasn't your ratchet, the socket skipping, or the bolt breaking free of the nut. No, no, instead what YOU heard was the "snap" of the welds breaking loose that held the nut fast to the little "cup" on the side of the frame. Ah yes, you're in a pickle now... you're trying to remove your crappy OEM shackles and instal those awesome extended shackles that promise to give you lift and better articulation... but what are you gonna do now? Have no fear, there IS a solution... and it doesn't involve major surgery. - New bolt AND nut. I can't remember the exact size, but the one that goes through the rear leaf spring eye works perfectly... along with the nut that goes with it. - New shackle - be it an OEM or an extended shackle, either way you're going to need a new one. This process is going to destroy the one that's on there. 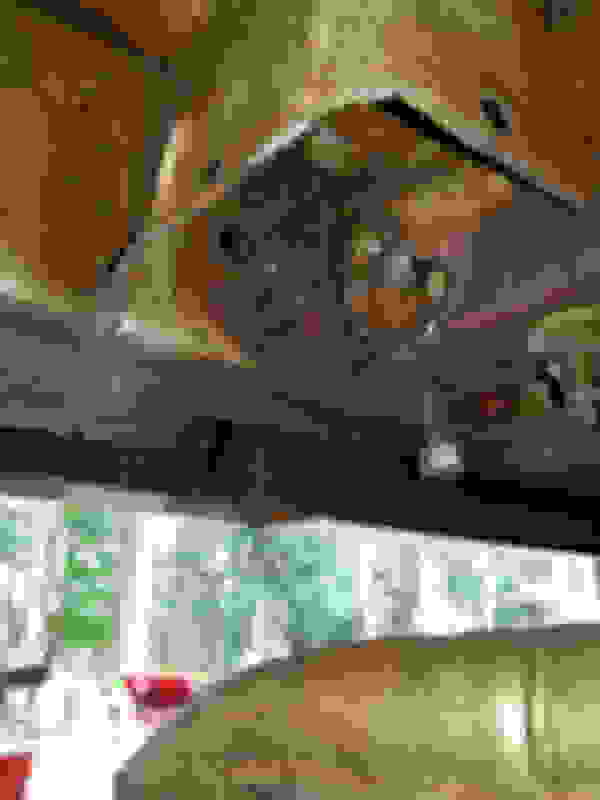 1) The first step in this process is to pull up your carpet in the cargo area and cut a "window" in your floor right above the frame rail where the bolt is. 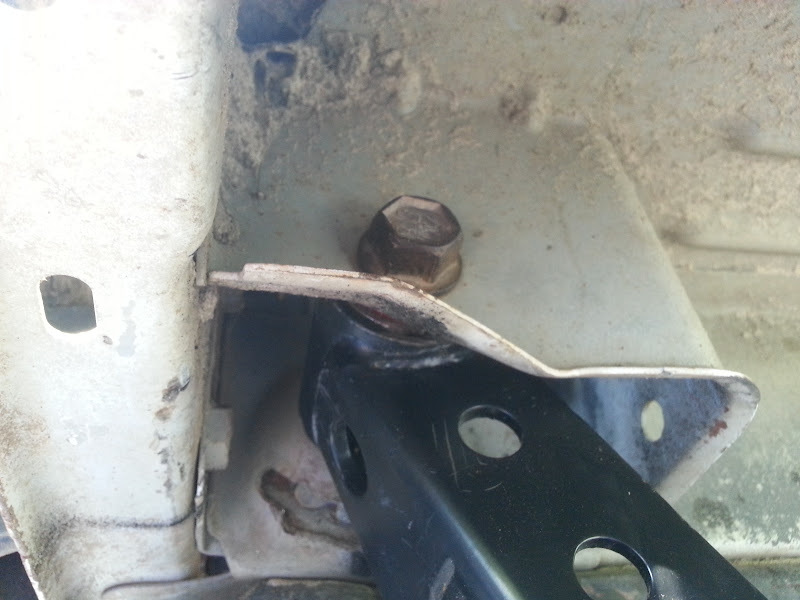 You'll need access to it to remove the nut and cut-off bolt. If you're not sure where your frame rail is in reference to the floor, pull your rear bumper off and look for two oval-shaped holes in the rear panel... these two holes (one on each side) are for inserting nutsert strips into the frame for installing a hitch, gas tank skids, aftermarket bumper brackets etc. You can either draw an imaginary line up and drill a pilot hole to get your started, or if you're still nervous - get a piece of masking tape and anchor one end to the hole, and bring the other end up over the cargo hatch sill and onto your floor. We're not looking for a huge hole here, just one big enough to grab the discards and get your socket into for the new nut. 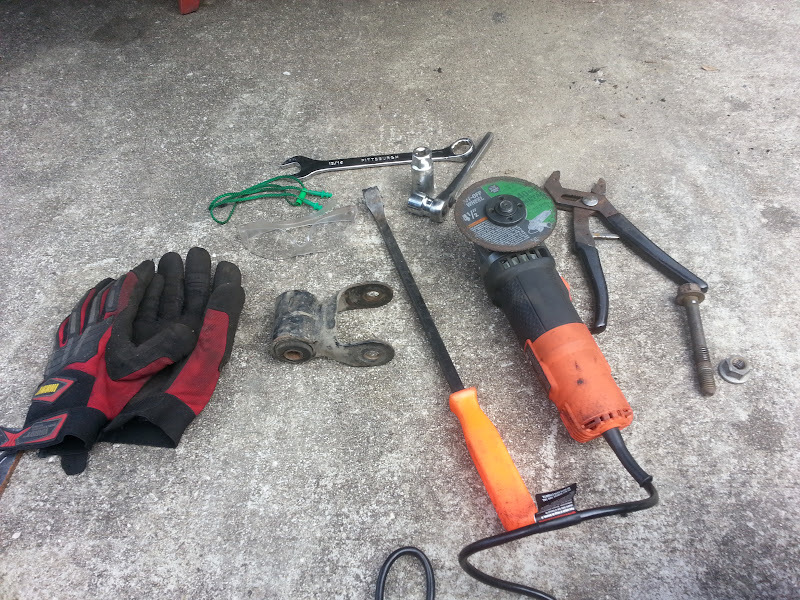 2) Next, you need to get the weight OFF of the offending shackle bolt. The main Idea hear is to support the frame with a jackstand and support the axle with the jack... if you don't have very tall jackstands, you can jack up the axle with the jack, take the wheel off, then lower it down onto the jackstand and voila - mission accomplished. Get out your grinder and have at it. Grind a slot right through the middle of that making sure it goes all the way through from one side to the other. 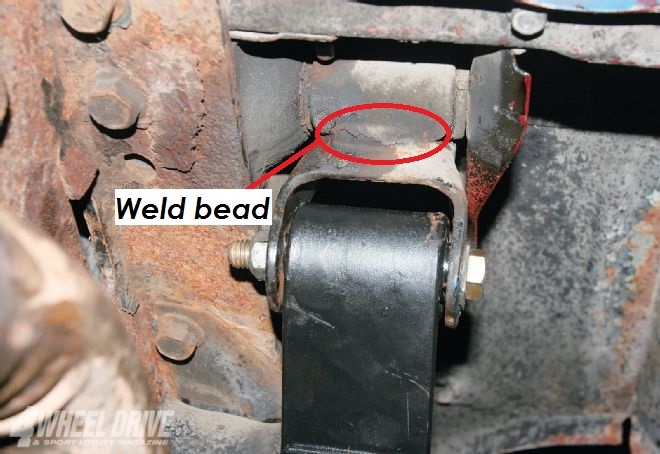 You don't have to grind the entire weld bead off, just make sure you go through it. 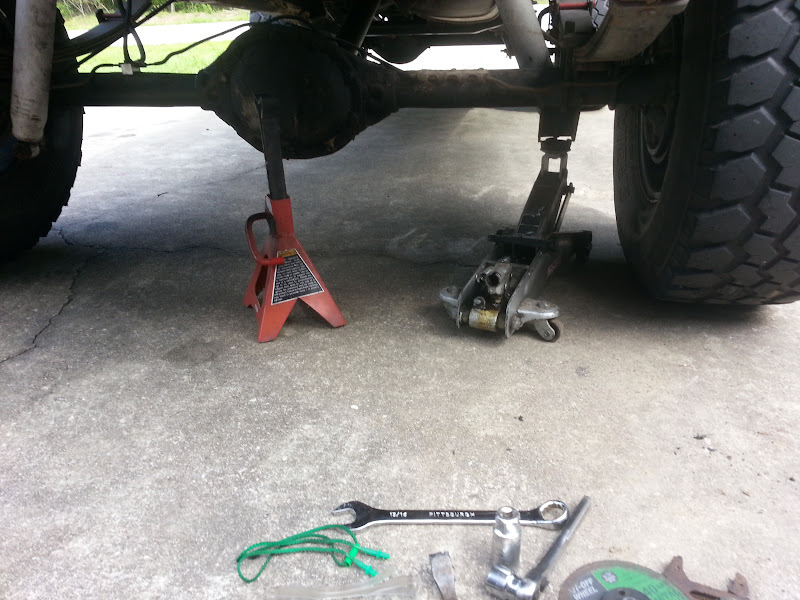 5) Now that you have the shackle and leaf spring out of the way, you can cut the bolt. 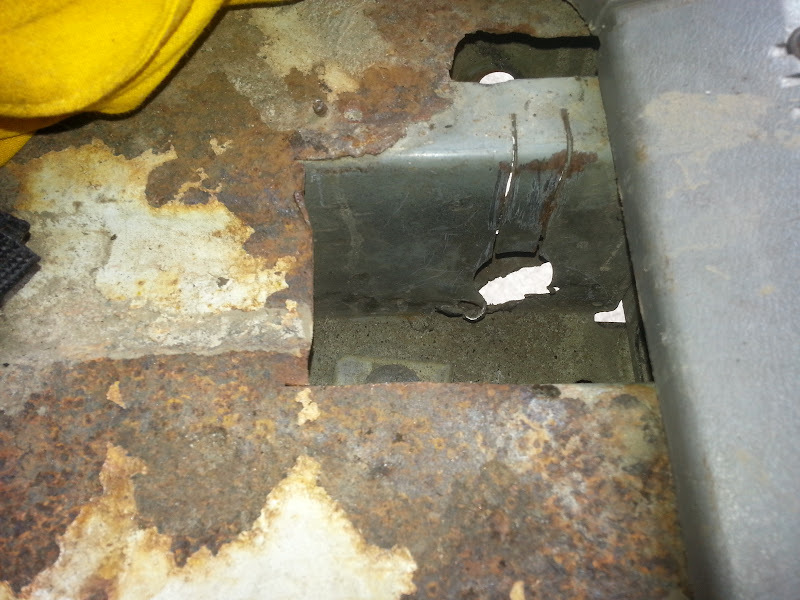 Put your grinding wheel between the shackle bushing and the FRAME... not the outter reinforcement. If you cut the end near the outter end (the side closest to the head of the bolt), it will still be too long to pull out of the frame. 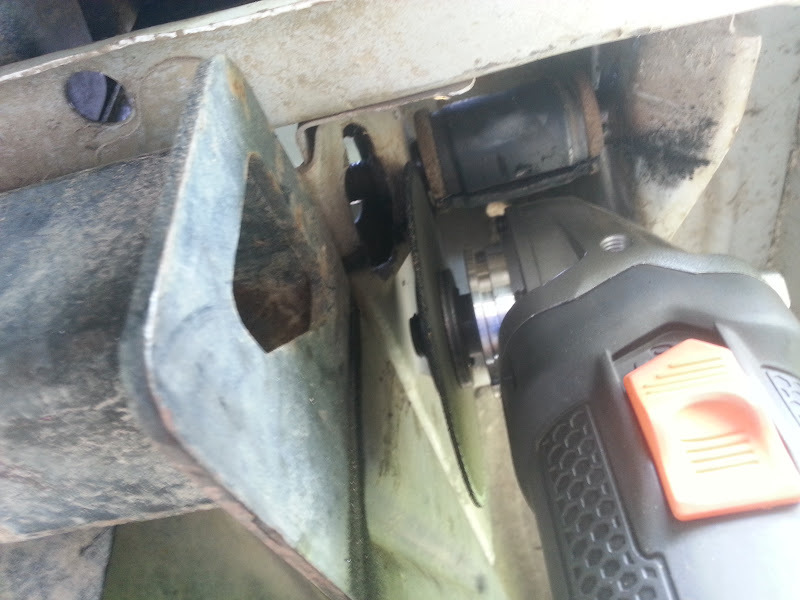 Be careful as you're cutting... it's going to want to "kick back" and (depending on which side of the jeep you're working on) cut the rear panel or the front of the shackle box... neither of which is a great thing. Believe it or not, it may look like it's doable, but if you get a socket deep enough for that, you're GOING to end up leaving it in the frame when you're done. BUT... if you cut the bolt down, you'll have more than enough of the bolt to do the job and have plenty of room in the frame to get in and get out like you need to. 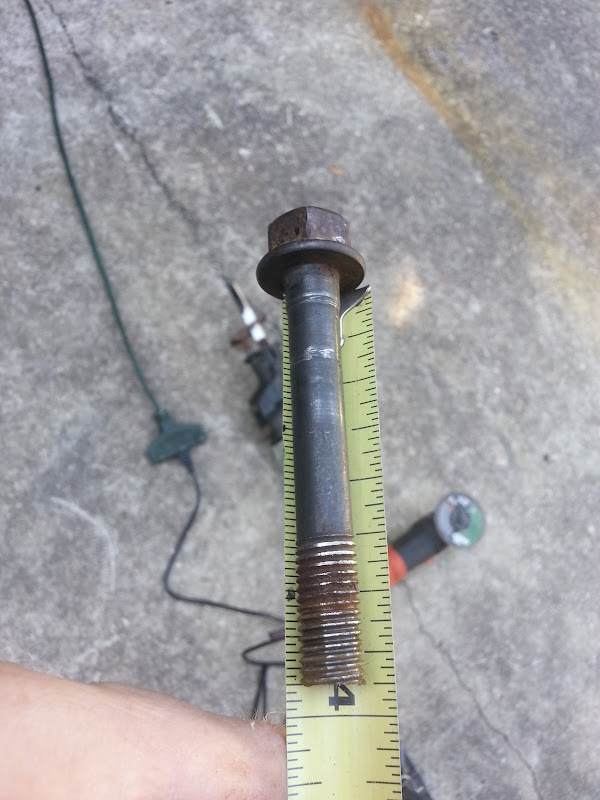 The bolt you're using is about 4 1/4" long (if you went with a leaf spring bolt)... either way, cut that puppy down to 3 3/4"... that's all you need. It will sit flush with the frame, but leave a good 1" in the cup for the nut to do its job. Once you've completed all this, you can either weld in a patch for the window in the floor, weld the nut to the inside of the shackle cup (I don't know how you would, but some of y'all welders have some real talent), or make a hinged "door" to give yourself future access to it. Get creative - it's YOUR JEEP! Now get out of your head and go do it. If you can turn a wrench, work a jack without dropping a vehicle on yourself, or operate a cutoff wheel without exposing your insides to the world - then you should do this. You'll thank yourself later. Questions, comments (good or bad, whatever), suggestions - you know what to do. Very nice write-up sir. Good way to instill confidence in the weary! Since you already did the hard part of going through all this and providing pictures, I want to provide a bit of my own experience with these. When I know I'm going to be tackling leaf spring bolts, I'll use heat. Hold your "you'll burn the bushing" comments everyone. If you use heat correctly, it can be your best friend in this situation. This also works for the front leaf spring bolt! And if you have access to an impact gun and some good swivel sockets, you're that much better off. If not, you can make it happen with hand tools but it requires a lot more patience. Oxy torches or Map gas, I could care less which you use (it doesnt require super hot temps anyway). Start heating the bolt head. The idea here is to get the entire bolt hot, but not about-to-melt hot. Be careful not to apply too much heat in the same spot for too long as it will distort the head. Take your time. Let the heat travel through the bolt. If the head starts glowing super red, take the heat away for a few seconds, then reapply. 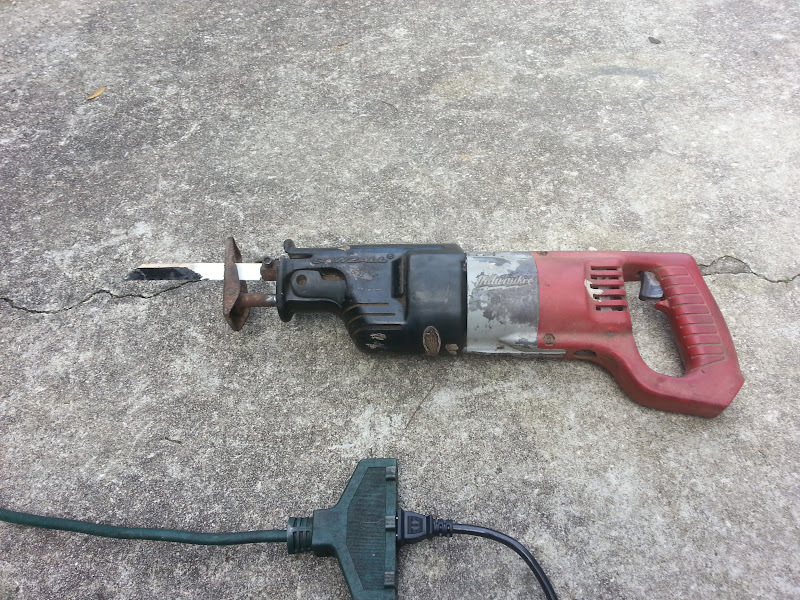 Once you think it's had a good heat sesh, throw your breaker bar or impact gun on. Don't go attacking this thing if the head of the bolt is cherry red, you'll twist it right off. Some glow is ok though. GO FORWARD FIRST! 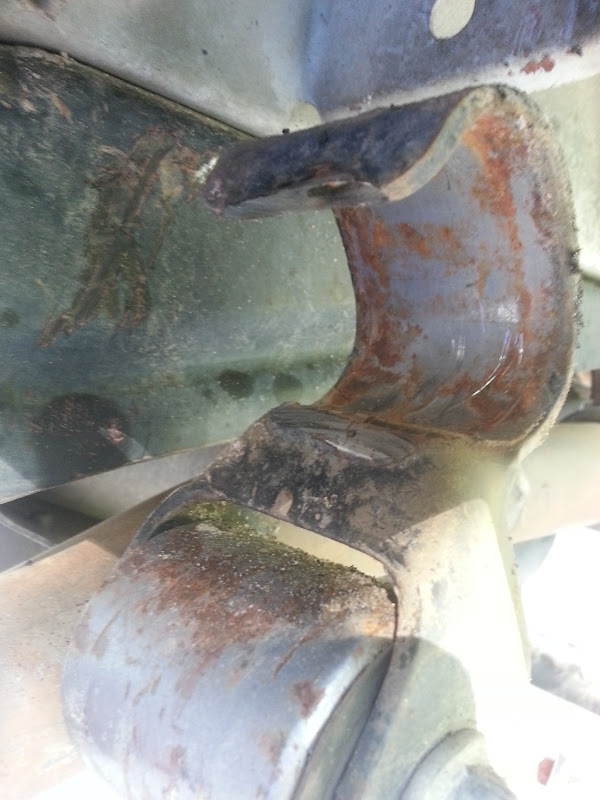 I say this for the reason that if the bolt is seized to the weld-nut then it will give it some room to knock the rust off instead of dragging it through the threads. Don't go crazy with pushing or brapping your gun. A bit of pressure and a brap or two is usually good enough. You may even feel it turn a little. That could be a "pucker" moment (especially if you over-heated the bolt head) but don't worry if you heated it correctly, it's always been a good thing for me. Now try removing the bolt. If it isn't budging go forward a little, then apply harder pressure in reverse. Try this a few times. You're trying to free the bolt up in any direction. The more it can wiggle the better! Back and forth, back and forth. If you aren't getting any or enough wiggle, go back to heat and repeat these steps. It takes patience but this method hasn't failed me yet. EDIT: I wanted to add this tid-bit. Through my years of wrenching, it has become a habit to slightly turn bolts forward a tiny bit before running them in reverse, especially rusty uncooperative ones. Hopefully this will help some of you even if it's not on leaf springs. Last edited by Jeepin'_Aint_EZ; 07-31-2016 at 06:23 PM. I like to use my 007 "Lazer" watch. Both of these are good write ups. I plan on trying to get a drill hole in the nut area and hit with some penetrant day or so before getting out the impact. I too like the forwards before backwards tip. that's some damn determination there Bass. Nice job on the pictorial write up. I hate it when some genius "tells" you how to do it without showing a single shot of what they're talking about. Last time I tried to follow a tech write up like that I ended up putting in a twin stick shifter on my 205, and when I'd engage lever 2, the fuel cell would fall out. ^^Thanks for the comments and tips guys! Heat is definitely a good way to attack a stuck bolt. I've never tried Jeepin's method of heating the head, but through transference, it should definitely work. Just be careful as he said to avoid distorting the bolt head. 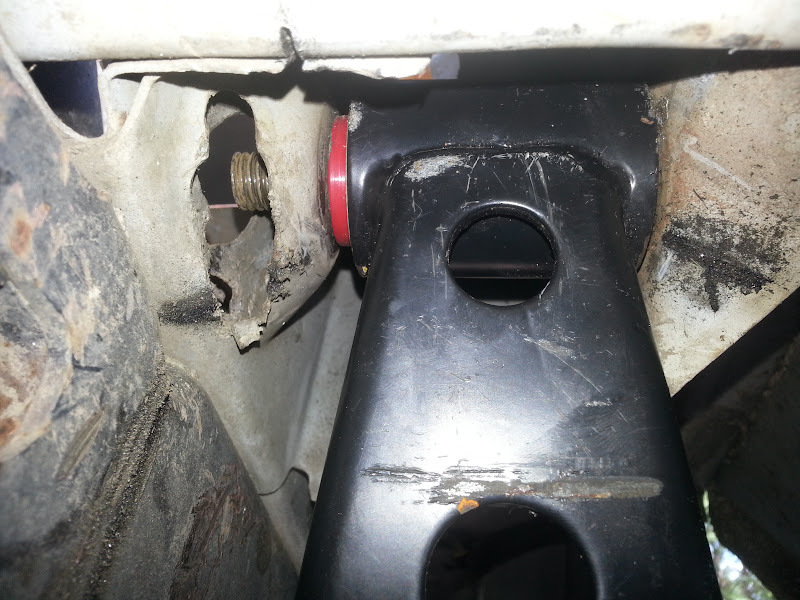 I'd also like to mention that this heating method works for control arm bolts too (basically anything that requires a bolt be removed from a bushing). I've worked on a lot of jeeps in the rust belt and would try anything before resulting in actually cutting the bolts. I don't have a 100% success rate unfortunately lol. I've used countless sawzall blades to cut control arm bolts out because that damn bushing will turn a blade to a butter knife within seconds. I tried greasing the sides of the blade but that didn't always help. It's always nice to have a few weapons in your arsenal when attacking these problems. 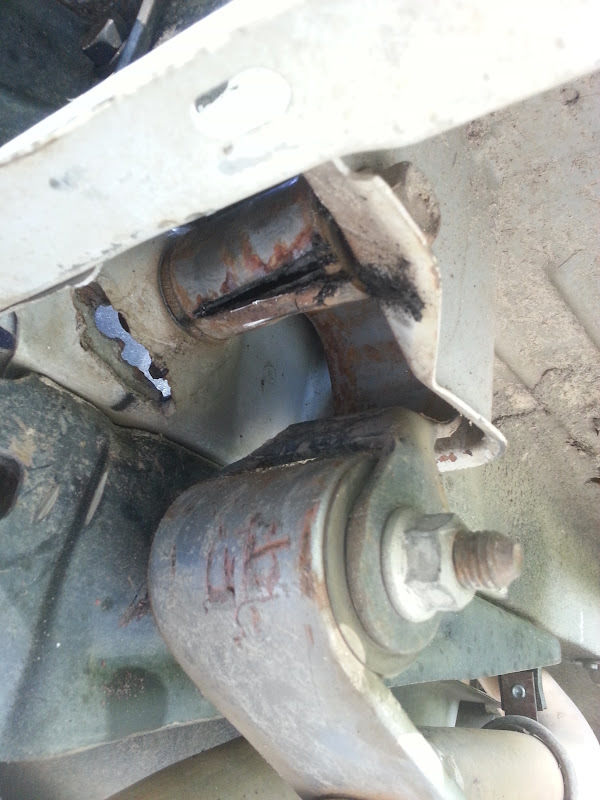 It seems that *most* of the time, the bolts seize to the bushings. Doing what Krakker says helps if you have some time to prep. Believe it or not, air tool oil is great for soaking bolts overnight and has a good "creeping" property which I tried a few times with success. If it were mine, i would weld it back together. I don't have the Jeep anymore, but up until I sold it a couple months ago, it was holding up fine. For that much material being removed, however, I would weld it up if you have the means. Preventative measures - How to keep 4 speed auto trans cool? What shackles to use with no lift srbs? 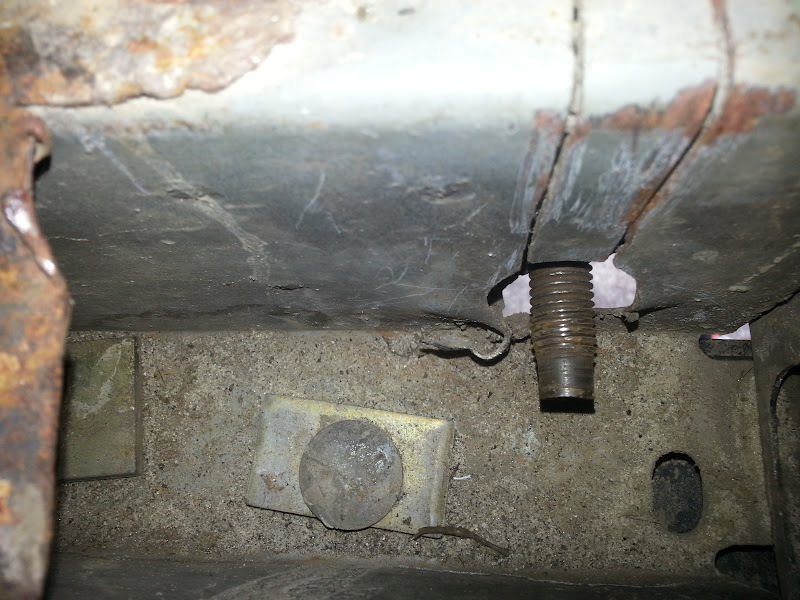 Quick Reply: Shackle bolt weld-nut "spinning free"... here's the fix.